Schematics have been at GEOFEX for a long time. R.G. wrote: Schematics have been at GEOFEX for a long time. has anyone found a layout for the fuzz section of this design? i recently heard a clip and it's a beast! RnFR wrote: has anyone found a layout for the fuzz section of this design? i recently heard a clip and it's a beast! 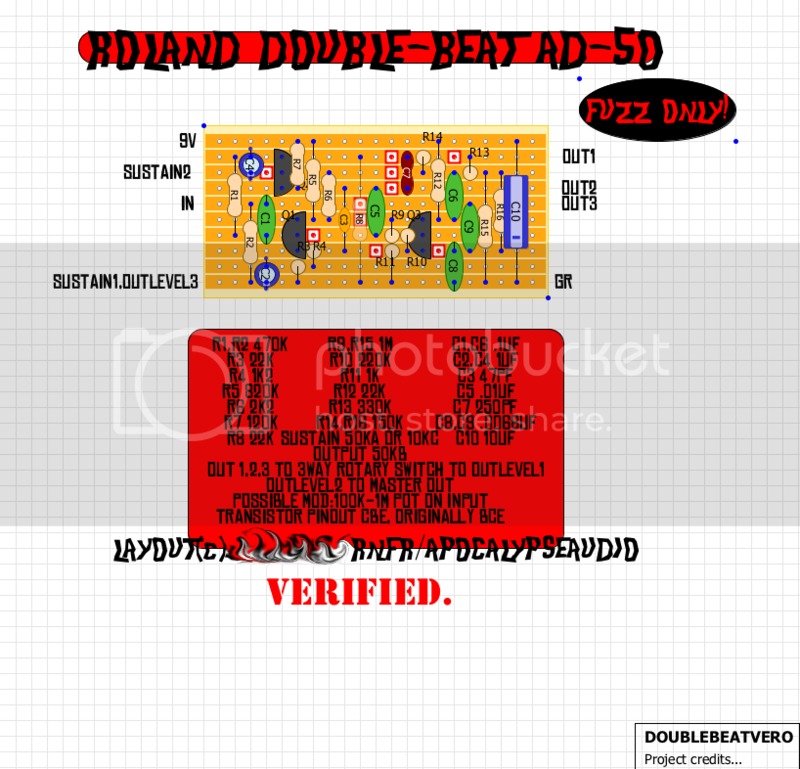 I've been looking around for a layout but I think this is going to be my first attempt at designing a PCB. Ambitious I think. Fail pending. there is clearly another pot visible. i'm guessing it's a volume pot, but does anyone know the value? another thing, would it be possible to wire the 3 outs with a on/off/on dpdt? or must you use a rotary? Im looking at some photos and there is definitely a 50kb pot for output level and from what I can see its just wired in after the tone selector. There is only the 10k gain pot on the schematic Im looking at which tells me its probably just a final master volume after the tone selector at the output. I guess that's considered obvious in the world of schematics? I wouldn't have thought about it until you brought it up really. I didn't really know so I guess that makes two of us. also, i've read a few comments about how this box sounds good with your guitar volume rolled back. this could easily be remedied by putting a "pregain" pot on the front end. i'll include that mod on my layout. alright, here's what i've got. i think i got it pretty tight, all the parts on a decent sized board. i'd appreciate it if somebody could double check this one for me. it's probably my most in depth vero layout yet, but it looks good to me. RnFR wrote: alright, here's what i've got. i think i got it pretty tight, all the parts on a decent sized board. i'd appreciate it if somebody could double check this one for me. it's probably my most in depth vero layout yet, but it looks good to me. Looks pretty good at first glance. All the value listings are pretty hard to read though. Might help a little to put those in a regular font and space them out a bit. Looks good otherwise. Have you built it? i haven't built it yet. and as for the font, it took me fing forever just to write them out to begin with, so i doubt i'll be doing it over. is there a better way to do lists in DIYLC than just placing text for every single component? maybe i'm an idiot, but i haven't found any. Last edited by RnFR on 21 Dec 2008, 02:30, edited 1 time in total. Beside the missing output poti in the old schematic floating around, there is missing on the Wah-section a 10µF electrolytic from + to gnd, and a 4k7 resistor between the 220n capacitor (coming from the slider of the wah pot) and the base of the second transistor. thanks for the corrections, AG. maybe i'll draw up a correct schem one of these days if you haven't. one more question- do the outs on the schem correspond with sine, square, and triangle top to bottom? Last edited by RnFR on 21 Dec 2008, 02:46, edited 1 time in total. Didn´t have time to redraw it - only made correction remarks in my files yet. here is the accurate (i believe) schem. AG, if you could give it a look that'd be great. that's a lot different than RG's wah schem. he had the inductor coming off the 2nd transistor. i'll fix it up and change the link. so, does anyone know how the outputs correlate to the sine, square, triangle switch? i'd like to label the schem properly. here is my updated schem.